SEMI says the total wafer fabrication materials and packaging materials were $22.76 billion and $20.70 billion, respectively. Comparable revenues for these segments in 2012 were $23.44 billion for wafer fabrication materials and $21.36 billion for packaging materials. For the second year in a row, substantial declines in silicon revenue, advanced substrates, and bonding wire contributed to the year-over-year decrease to the total semiconductor materials market. In 2003, the cost of silicon material and photomasks was around 40%, whereas in 2013 it share has decreased to some extent, and the share of substrate material as increased significantly from 2003 to 2013. Region wise, Taiwan remains the biggest consumer of semiconductor material due to the presence of world's biggest foundries. China and Europe has also seen increase in consumption of semiconductor material. 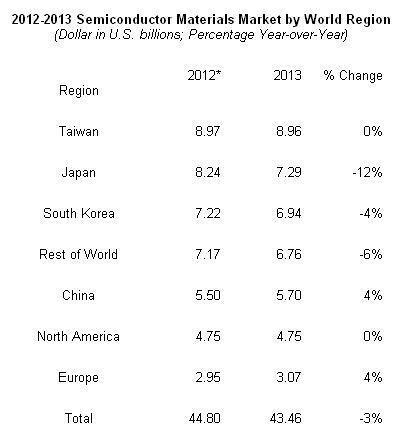 The North America market remained flat, whereas Japan contracted by 12%. The rest of the world region which includes Singapore, Malaysia, Philippines have also seen lesser consumption.